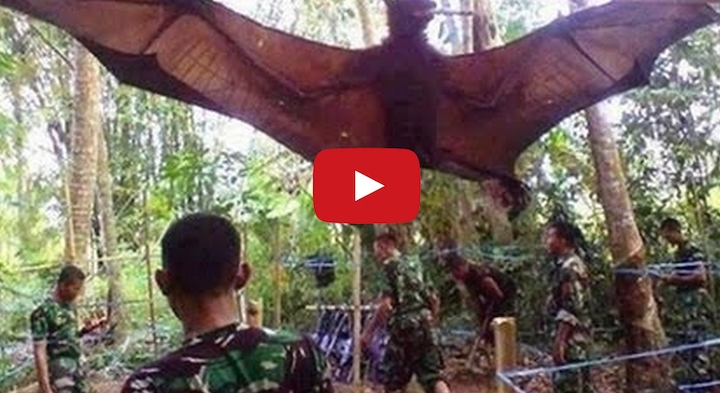 Giant Bat With 6 Ft Wing Span Captured In The Jungles Of The Philippines. The giant Golden Crowned Flying Fox Bat is a rare species, and one that features very long wings. Their wings are so long that it is often seen with them wrapped around the body like a cloak, similar to the vampire movies. The wings can end up being up to 6 feet wide when fully displayed. They weigh about 2 1/2 pounds each. It is considered to be the largest bat in the world. This bat has a face that looks very similar to that of a fox. They have a long snout that is very similar to canines.